Michael: This is based on the C major scale: C, D, E, F, G, A, B. What notes make up the I, IV, V? Michael: Notice the pattern is the same as a A Minor Pentatonic scale. 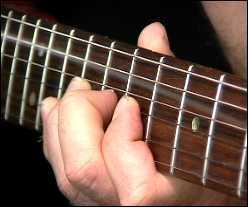 In this case the C Major Pentatonic is RELATIVE to the A Minor Pentatonic. Notice you start on the C note as the root instead. I highlighted the ROOT notes "C", so you can play the barre chord, move a step and 1/2 down, play the pattern and it gives a country rock/rock sound. Now you can follow the scales with the chords. 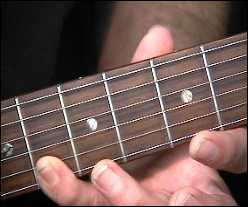 Here's the F barre chord and F Major Pentatonic. Michael: See how it changes positions, but same pattern. Make sure you practice these scales, you'll need it in a little bit. Now, here's the G Maj barre and G Major Pentatonic which is the V of the progression. Michael: Same chord and scale pattern for each neck position. Now here's the progression we're going to play the coming licks over. Michael: Here's a jam track you can practice the licks over. Teacher: Notice how it follows the progression, same lick, different positions. 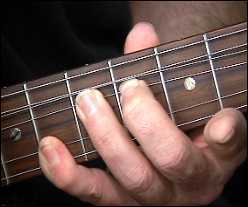 Notice you position your hand using the 4th barred on the 8th fret. The highlighted notes are the root notes. 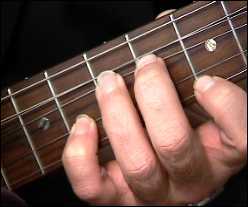 Michael: Notice the 2nd finger supports the 3rd when bending the 3rd string. The jam track will give you an idea on the phrasing. Michael: This lick is a lot like the last one but playing 3 notes at a time for the beginning of the phrase. Here's a jam track you can play over. Michael: The last lick sounds very country, it shows the country influence of the Stones. Michael: Adjust your thumb to pinch the back of the neck. Razz: Great strengthening exercise by it self even! 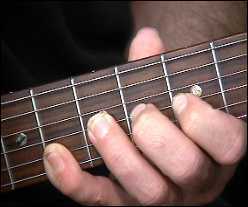 Tonester: Are you "clawing" with your picking hand? 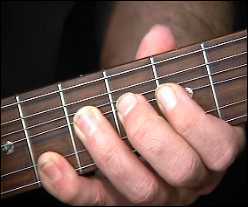 Michael: You can Tonester, but I'm using a pick for this example, but the clawing will really make it sound country 8-) Also try holding the 3rd string up with out bending to neutral position while playing the other strings as well, it sounds cool! arpeg: What does clawing mean? 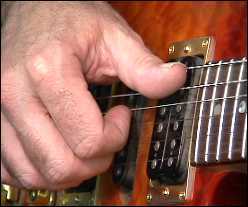 Michael: Using you fingertips to pick by hooking them under the strings. Here's a picture of this technique. Michael: Well class it was great having you all, see you next lesson!